As one of the oldest moving companies in the United States, Bekins Van Lines has survived from generation to generation for a reason: unrivaled expertise and a commitment to customer service. 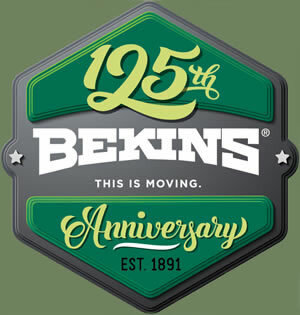 The 125th anniversary is more than Bekins’ founding date: It’s 125 years of serving our customers and partnering with our agents. This is an incredible milestone that deserves to be recognized and celebrated. Bekins Vanlines is the oldest continually operating vanline in the United States. Founded by brothers John and Martin Bekins in 1891, Bekins began operations in Sioux City, Iowa, with just three horse-drawn vans and twelve employees. Since then, we’ve grown to become one of the nation’s largest full-service moving and storage companies with nearly over 400 agents and offices worldwide. As we’ve grown, so have our services: Today we specialize in moving high value items, international relocation and our long-time business of interstate moving. Bekins continues to be a worldwide leader in moving. Whether it’s household moving, corporate relocation, international/overseas moving, or any other type of long-distance move, we’ll handle it with the expertise our customers have come to expect.